We read about "being justified" in the Bible. 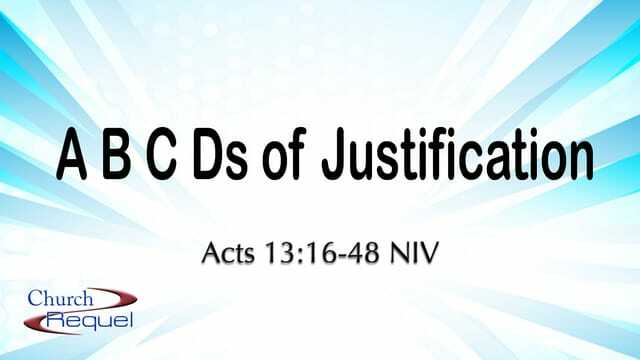 We come across "justification" in today's study of Acts. What does it mean? Much more importantly to us - what does it matter? Today we dive deep in our study of this essential concept of our Christian faith. Open your Bible to Acts 13 and prepare your heart for celebration! Here at Church Requel we want to celebrate the good news of Jesus in a way that makes sense and relates to every day people. From the songs we sing (contemporary) to the clothes we wear (casual) to the language we use (understandable) we want to be “requel” in our approach. We want to retell the story that has been around for more than 2,000 years in a new, fresh way with a message each week that is straight from the Bible. We invite you to join us as we sing, pray, celebrate and learn from the Word of God. We continue to need non-perishable foods. When you come to church Sunday mornings bring some food to share with others, who may be sitting in the pew next to you. The Food Pantry is downstairs and will be open for 15 minutes after each Sunday service. You are welcome to receive food if you have a need. We are looking for volunteers to work in the food pantry 15 minutes each Sunday. Please see Sheri if you are able to help. Use the link below to make a one time donation to Church Requel using your debit or credit card. We want to make sure you know that we provide this as a convenience for those who use the debit or credit card responsibly in their financial lives. It is not our intent for you to go into or add to credit card debt to give to CR. We appreciate your ongoing financial support of our ministry! Here is your online link to everything Church Requel on the Internet. Here you will find all of our sermons, in video and audio. Each week our pastor writes in his online blog and publishes an audio podcast. You'll find all of our pictures, our Facebook page and our Twitter feed. You can even connect with other Church Requel folks in our online community! A - Justification is an __________ of God. Paul lays out the history of the Old Testament. Not just stories of Israelites. Stories of God's acts! Are you living out your Christian life as if it's to be it's up to thee? That's a tough way to go - with the responsibility of everything (including our righteousness) riding on our shoulders. Living out the gift of God's justification upon you is so much better. Such a wonderful gift! B - Our justification is solely on the _____________ of the obedience and death of God's Son. Some people struggle with this idea of God simply giving the gift of justification, the gift of making us right. What about justice? How is that fair? Can God simply declare it? Can God simply call wrongs right? NO! The gift isn't free. There was a terrible price. Both of these terms, "sinners" and "righteous" are legal terms explaining our positions. Solomon Mark - my newest grandchild, as pure and seemingly as perfect as can be, is born a sinner. Just like every other human. Why? Because of Adam's sin - infected all of us. In the same way Jesus' righteousness is made available to us through his obedience. C - We are justified by faith alone when we _____________ our trust in Christ. Confession means agreement. When I confess to God, I am agreeing with God. We usually consider confession in terms of confessing our sins. But there is also another confession in the life of every Christian - confessing our total trust in Christ for justification. Often Christians are referred to as "believers." We believe in Christ. That belief is not just that He exists, or that He is the Son of God. Our confession is our belief in Jesus and Jesus alone that we are justified before God - that we are righteous before God. And this not because of anything we have done or could ever do. "Not under the law of Moses" means we don't become righteous by following all the rules. Our righteousness is Christ's righteousness - and that is a total gift! We've talked about justification as a legal term, a declaration by God in His court. But we could also talk about it in accounting terms - debits and credits. We don't receive (credit) righteousness because of our doing (wages, debit). God doesn't OWE US. But out of a gracious heart, He translates our faith (belief) in Jesus into the credit of righteousness. So then, what is our motivation for living a righteous life? D - Saving faith must ______________ itself genuine by life change and good works. A true, real Christ-follower would never intentionally drag Christ and his sacrifice for us through the mud of repeated, sinful, unrighteous living. There will always be a change in us. Jesus told us that if we love Him, we will keep His commandments. We will follow and obey his instructions. We will live to do His will and not our own. This is the heart's desire of every Christian. It is the confirmation of our appointment for eternal life. We struggle with this - are we righteous because we believe? Or are we believers because we were appointed by God to believe? The answer to both questions is "yes." We could never choose God unless He first chose us. It's all Christ! And yet at the same time we have chosen to trust Christ. How could we "choose" if we never had a choice? We couldn't. God chose us. We chose Him. We live out that dynamic of God's work in our life by always working for His will! Our living out the Christian values that Christ laid out for us comes as the natural desire of all who genuinely love Christ and believe in Him and want to follow Him. Our genuine faith always expresses itself in genuine love. Love is expressed through righteous acts. Righteous acts come out of a wellspring of righteousness (justification) given us by God alone!